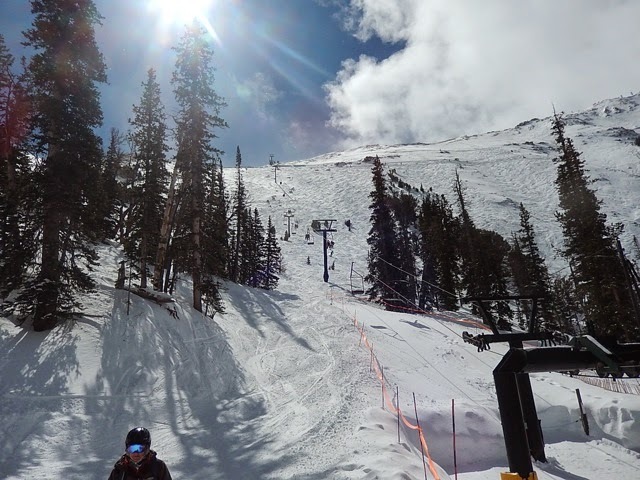 On here my fourth and second to last day, I had a great run in the Headwaters Bowl. 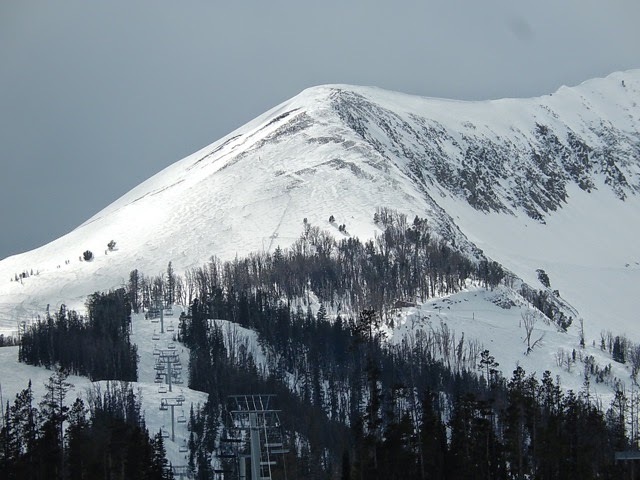 I took the Challenger lift up, then skied over the top to the Headwaters area of Moonlight Basin. One of the nice topographical touches on that part of Big Sky is the access to the Headwaters Bowl and lift from the top of the Challenger lift. Very few people were around, and it was peaceful and windswept and sunny enough for a low-visibility day. It's very steep but the snow was soft and deep (Western Montana has a huge snowpack for April). 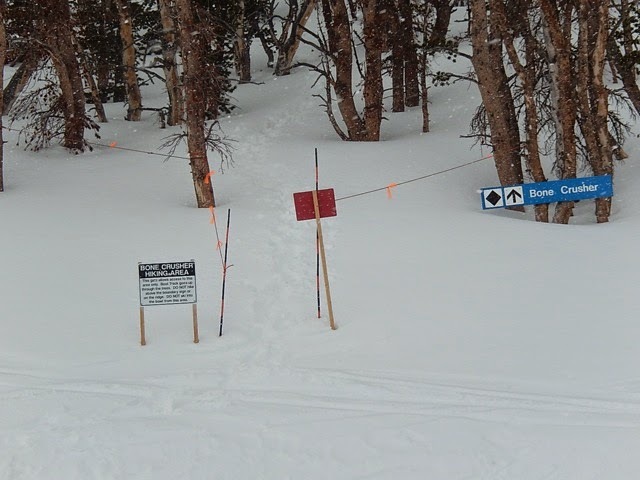 I made some turns and went through some trees to the skier's right of Alder Gulch, then went faster down the Bowl where the pitch flattens out somewhat. I've always had my eye on a trail called bonecrusher, which is a bootpack or hike through some woods and up a slope several hundred meters. Coming up not long after my Headwaters run, I saw an opening (the ski patrol had literally opened the bonecrusher trail). So I took my skis off and started hiking. I was lugging kind of heavy resort skis, not backcountry boots or skis, so it was a reasonably hard workout. Can't beat the view though of the surrounding Montana Rockies and 11,160 foot Lone Peak looming overhead. I used the trail made by two cheerful young lasses with snowboards, who were the only other people plus me who did it that day. They got most of the way up and made a snowman, while I was grimly stomping uphill like I was finishing Everest or something. I was doing the classic two-step shuffle, then stop to catch your breath. It's very blown off on top and mostly rocks through the otherwise deep snow. I would guess the top is at least 9500 feet in elevation, hopefully higher for the purposes of bragging rights! The two ladies eventually stepped into their snowboards and blithely headed off, making wavy marks in the snow. Then came the hardest part for me, which was putting on my skis. Try it sometime, standing at a fairly steep angle in deep snow. I dug a little trench for the skis, knocked the sticky snow off my boots, and finally succeeded in clicking in, after imagining how awkward and energy-wasting it would have been to hike down with all that stuff. The picture on the left shows our bootpack or trail, a little line above the trees. Then I had my own powder run down after "earning my turns"; very satisfying. As for a tram run off the top of the peak, there's always tomorrow!